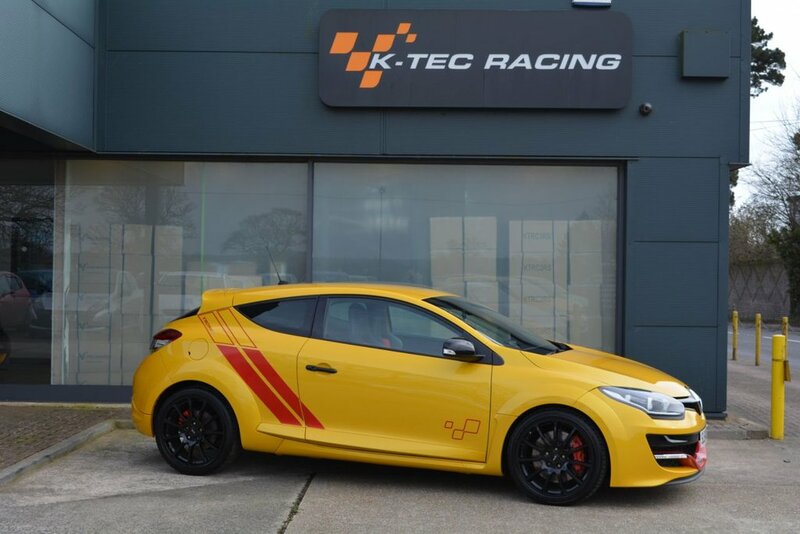 We are very pleased to be able to offer one of the rarest and most sought after Meganes for sale in the UK, a Liquid Yellow 275 Trophy-R!. This two owner car is one of just 30 UK cars and has covered 43,000 miles from new and benefits from a full Renault service history. It features a great specification which includes Recaro leather/alcantara buckets seats, rear brace bar with cargo net, Akrapovic Titanium exhaust, Ohlins suspension with composite springs, climate control, Renaultsport R-Link V2 monitor, Ring pack with lightweight battery, harnesses, 2 piece front discs and new Michelin Cup 2 tyres. The car is MOT'd unitl June 2019 and will have passed our thorough workshop inspection and preparation before going to its new owner. This really is a very rare opportunity to own one of these cars. Free self adjusting finance calculator available on request, just email us for a free no obligation quote. Fully tailored low rate finance packages available with low deposit and up to 5 year term. Warranty extension from our standard 6 months to 15 months from just £149, please contact us for more information. All cars Experian Auto Check clear.